Bucks County Council say that the overflowing skips at Aston Clinton recycling centre yesterday (Monday) were as a result of staff shortages which led to a struggle to cope with demand. 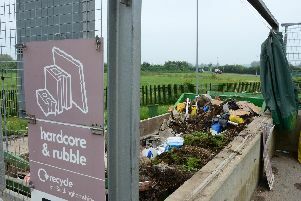 A caller to the Bucks Herald newsroom yesterday morning said: "A huge amount of waste has been dumped there (at the Aston Clinton recycling centre). "Every skip is overflowing with waste piled in front." In response to this paper's enquiry about the overflowing skips at Aston Clinton, Bucks County Council's cabinet member for planning and environment Bill Chapple OBE said: "Fine weather during the weekend at this time of year can sometimes lead to a sudden spike in demand for the county's household recycling centres, which can lead to a build-up of materials on site. "All sites were very busy last weekend, but Aston Clinton had staff shortages due to sickness which made it difficult to cope with the increased demand. "However, this year there is definitely also the effect of the upcoming introduction of charges for non-household waste, with people bringing along anything that might be chargeable after the April 1 deadline. "Although this is understandable, it does mean that it can make the sites very busy – if you want to avoid getting stuck in a queue, I'd advise checking the online site webcam before you visit in the lead-up to April 1, and remember that weekdays will be less busy than the weekend." From next Monday, summer opening times come in at the county's household recycling centres with closing time moving from 4pm to 6pm each day. The opening time stays the same at 9am. But this year, other changes are also taking place including the closure of the Aylesbury centre on Rabans Lane on Wednesdays and Thursdays. The sites at Chesham and Burnham will be closed on those two days each week while the centre at Bledlow will be closed permanently. Meanwhile, charges will come into force for all 'non-household' waste brought to the site.